Natalie Mering sure knows how to make an entrance. Walking onstage to a series of synths and a pair of prop candelabras, the floral pantsuit-clad singer-songwriter better known as Weyes Blood immediately captivated with her solo rendition of "Can't Go Back," from last year's Front Row Seat to Earth LP, having crafted an enchanting, haunting ambience thanks to the decor and icy synths. Unpacking technology-induced alienation through wistful '60s folk and '70s AM pop, it's her commitment to character that makes Front Row Seat to Earth — and her live set — stand out from other musical musings on the subject. While a reference to Drake's "YOLO," as done on the dirging "Generation Why," may come off as shameless cynical pandering in the hands of a lesser artist, Mering's earnest, judgment-free lyrics and direct delivery came through. Not to mention the shamelessness with which she embraces her influences, as evidenced in her cover of George Harrison's "Run of the Mill," which sits at the intersection of her two main wells of inspiration. The newly minted Sub Pop signee offered no hints from her forthcoming 2018 record, but, with her backing trio, she revisited nearly all of Front Row Seat, with plenty of instrument shuffling to ensure each song was given the arrangement it warranted — an additional synth here, some tambourine there. The fluidity with which the band cycled through their series of instruments led to the set's greatest moment, during highlight "Be Free": claves and synth gave way to drums and a slide guitar, culminating in a rapturous slide solo. 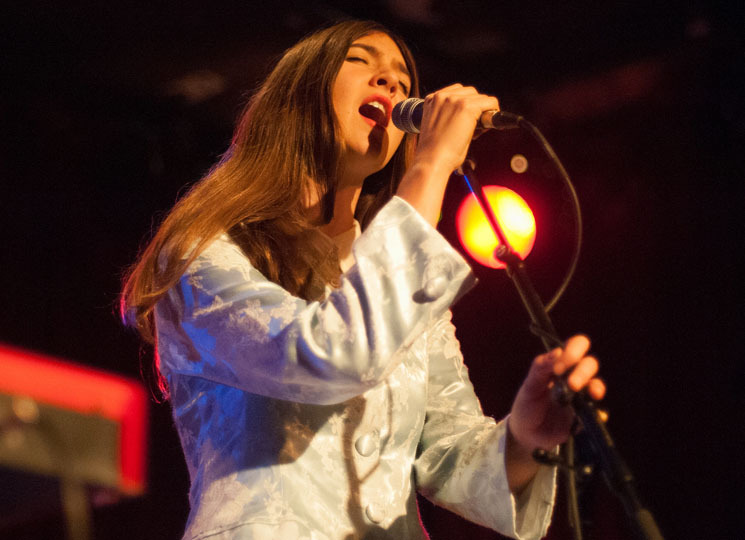 Using sonic touchstones of the past to guide listeners as the world approaches a tenuous future, Weyes Blood's POP Montreal performance solidified Mering as one of the music world's most effective shepherds.